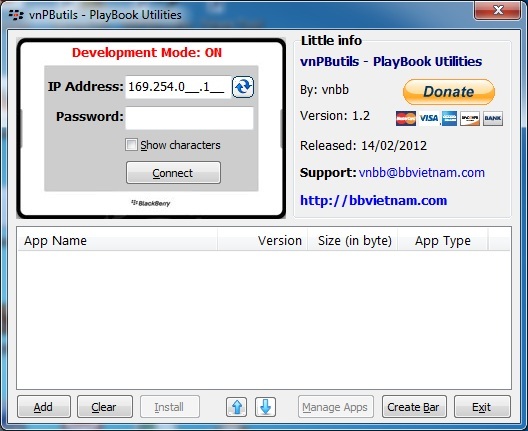 vnbbUtils is an application based on JavaLoader with friendly GUI and many improvement (such as OTA downloader, IP Modem, Quick Install, remove IT Policy, Create JAD …). From version 2.0.3.3, vnbbUtils is added multi-language support. Get information of the BB that connected to your computer (automatically detecting BB is connected/disconnected to/from the computer). Providing this information for OTA Downloader and EScreen Activation code generator. 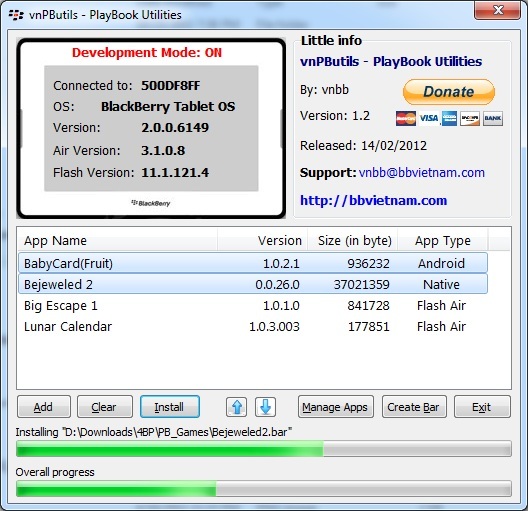 Especially, it help OTA Downloader simulate the environment of your BB to download the suitable version of software with your BB (same as you download by BB’s Browser). 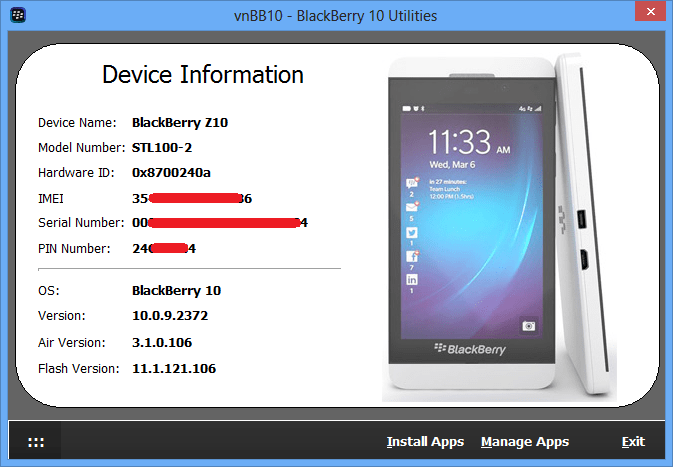 USB Driver: Install USB Driver for Blackberry. If you have not install BDM yet, Computer can not recognize your BB as an USB Drive. Only click on USB Driver button, that problem have been resolved, BDM free . 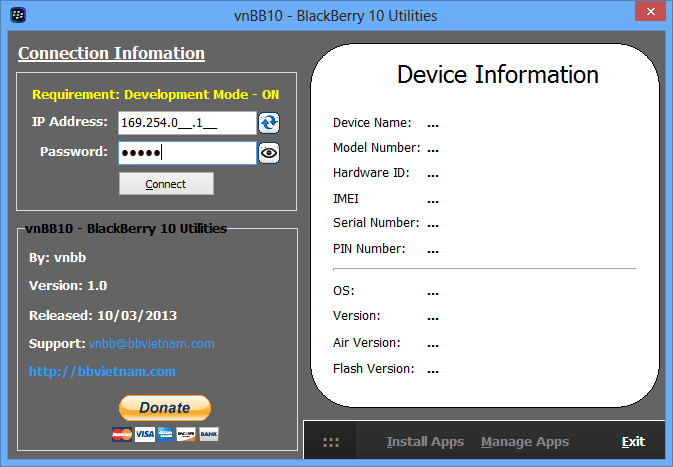 This driver is only for USB Drive, not for BB device manager, so if you want using full functions of vnbbUtils, install BDM is required. Reset Blackberry: Reset your Blackberry same as Battery Pull quickly. Factory Reset: remove IT policy. Load OS: this function allow you select exactly which version of OS you want to install into BB, don’t need to uninstall other version, and automatically delete file vendor.xml then run Loader.exe to make sure you can Load OS from any vendor successfully. Clear EventLog: Delete Event log to release memory space. Backup / Restore applications, allows easy backup entire 3rd party applications from BB to computer (before Reinstall OS) and restore/reinstall all of them into BB (after Load OS) quickly. Install JAD: lets you install software on computer to BB from the JAD file easily and quickly. Helping people who using old BB model (do not have memory card) can install software normally without opening BDM. Save modules. 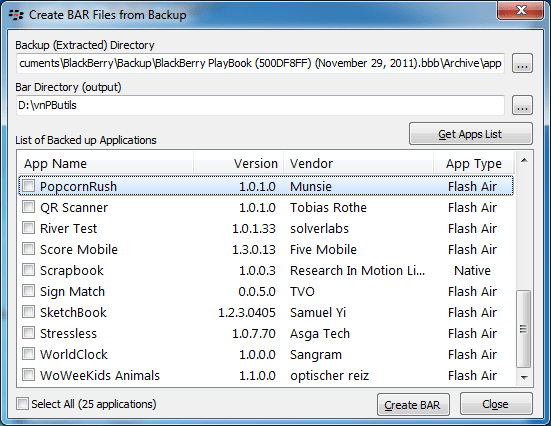 Necessary in case of backup applications or store applications that installed on your BB into computer. Delete unnecessary modules, optimizing memory of your BB or fixed some error that applications conflicted. Screen Capture: capture the current screen of your Blackberry and allows to save images in various formats (PNG, JPG, BMP or Copy to Clipboard). Automatic add watermark for that images, you can customize watermark by yourself (Text, Size, Color, Position). You also make a video stream by recording function. Download software for BB from OTA link to your computer. This feature has been improved superior to other OTA Download utilities, allows you to download from the site that check terminal connect to as Google, Opera Mini, mopipocket … Support download over Proxy, download from indirect link (as OTA Link provide by Mobihand). Downloaded Softwares are stored in folder .\OTA\App_Name. Download OTA really like you do on the BB Browser, lets you download the software for your BB easily. Create ALX file to installed by BDM. Created from JAD file or Cod files that available. Create JAD file to install from SDCard. JAD is created from ALX or Cod files. Convert JAR to COD(s): this feature allow you to convert JAR file to COD & ALX. – a little bug fixed. – Fixed error that can not connect to BB with password enable. – Allow change device when download OTA link. – Automatic Add WaterMark when run Screen Capture, WaterMark can be customized by yourself. + Screen Capture: add video recording function and allows to save images in various formats (PNG, JPG, BMP & Copy to Clipboard). + Download OTA really like you do on the BB Browser, lets you download the software for your BB easily. + To change the position of some buttons for more friendly. 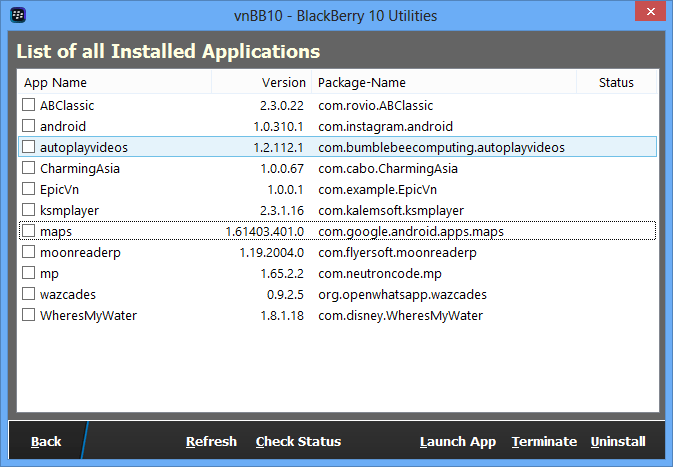 – Allow you select which version of OS will be installed into your BB. 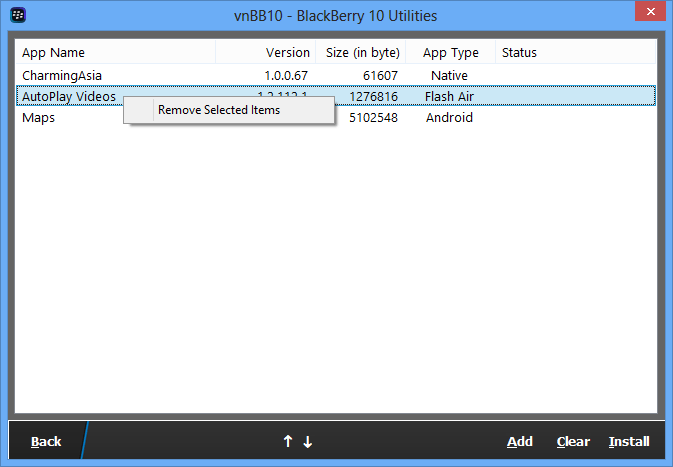 – Add options to allow choose javaloader version that suitable with your BB’s OS Version. This entry was posted in 1. My Utilities and tagged vnbbUtils, vnbbUtils v2. Three weeks ago, the BlackBerry Passport made its debut, and the reviews are still coming in, with more to come as it launches in other regions. Reviewers are discovering for themselves what “being different” can bring to the table, and a few are even having “conversion experiences” where their preconceptions were blown out of the water. This entry was posted in 4. Others. We now spend more time on our smartphones than with our partner, according to a study by mobile provider O2. And this phenomenon isn’t going away. With advancements in mobile technology, it has never been easier to work on the go. Answering emails and drafting documents does not require an employee to be chained to a desk. However, just because you can work from anywhere doesn’t mean that you should. “Turning off” is hard to do in this digital age. According to a study by IDC for Facebook, 67.8% of the U.S. population uses a smartphone, and 78% of the activity is spent on email and web browsing. It is easy to pick up the phone and send a quick email, which proves to be a problem when you are trying to enjoy vacation time and holiday festivities. It is common wisdom that transitioning from vacation back to work is tough. But transitioning from work to play isn’t easy either. It requires letting go of the to-do list – you know, the one that seems like it’s never done. It’s about really being present with the friends and family you probably don’t see enough. I’m not one for completely disconnecting when on holiday or traveling. I like to keep my BlackBerry handy for all kinds of utilities: travel apps, maps, music, BBM’ing with family and travel buddies. But, the utility of my BlackBerry is different in these times than when I’m at work. The BlackBerry 10 feature that I find myself using quite often is BlackBerry Balance – it separates personal and professional data and apps, so I can take a break and watch a funny video with my little brother instead of checking recent reports. Speaking of reading reports, BlackBerry Hub helps me get up to speed quickly once I return to work after the holiday. I filter emails by account, search, and flag items for follow-up in seconds to stay on top of the game. What about you? What are your best tips for “turning off” while staying tuned in? 103: The starting address for the boot .cod file cannot be found. This might mean that a boot .cod file has not been installed on the handheld, or that its format is invalid or corrupt. 104: An uncaught Java exception was thrown in the Java code and diagnosed by the JVM. Execution can be continued or the handheld can be attached to a debugger on a desktop through a serial or USB cable. The event log should contain the traceback of the thrown exception. 105: An OS file system API returned an error status for a certain operation. This can indicate a corrupt file system or an error in the JVM. 106: An error has been detected in the graphics system of the handheld. 110: Non-idle event downtime error. A problem has been detected in the accumulation of JVM down time that represents how long the JVM has been idle. This indicates an error in either the OS code or the JVM code. 200: Application manager threw an uncaught exception. The application manager event thread threw an uncaught exception and so cannot continue running. 201: Initialization of the cryptographic system failed and the handheld cannot continue to operate. 202: An attack on the key store has been detected, and the handheld cannot continue to operate. 203: The application manager console process, usually the Home screen ribbon, has failed, like due to an uncaught exception. Perform a hard reset on the handheld: Shut down, remove the battery wait a few second… replace battery then see when happens when it starts OR Run Application Loader to reload the operating system and applications onto the handheld. In BlackBerry? Desktop Manager, double-click the Intellisync icon. In the Handheld Applications list, select Calendar. Click Configure > Advanced Settings. The Advanced Settings for Calendar window appears. In the Handheld Configuration window, ensure that the check box beside the Calendar application is selected, then click OK. In the Intellisync window, ensure that the Synchronize PIM check box is selected, then click Synchronize Now. The number of calendar entries on your handheld is reduced. Run Application Loader to reload the operating system and applications onto your handheld. 502: All processes exited. The last Java process has terminated, and there is nothing left to execute. 506: An uncaught Java exception was thrown in the initial VM Java thread thus killing the only live thread in the system. The event log contains the traceback for the exception. 507: A dependency on a .cod file could not be satisfied due to a missing .cod file. Load the missing .cod file onto the handheld. You receive one of the following errors on your BlackBerry device while using Application Loader to install device software. Both errors indicate that no applications are loaded on the BlackBerry device. 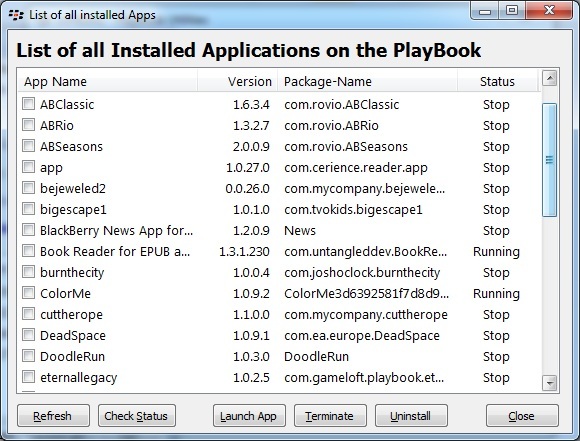 During the Application Loader process, the existing applications on the BlackBerry device were erased, but Application Loader failed to load the new applications. Verify that device software is installed on your computer. If your BlackBerry device is connected to a laptop in a docking station, disconnect the laptop from the docking station and connect the device directly to the laptop. If a third-party program (e.g. virus scanner) is using the same COM port as BlackBerry Desktop Manager, close the third-party application to free the COM port. If you are using a USB adapter to connect your BlackBerry device to a serial port on your computer, temporarily connect your device to a computer with a USB port. In Desktop Manager, double-click Application Loader. Use Application Loader to install the device software. You erased all the data and applications on your BlackBerry device by typing an incorrect password ten times in Application Loader. 508: Invalid object. A problem has been detected with a debugger command to the VM. 516: Error occurred during garbage collection, which might indicate a corrupted file system. 510: All threads are waiting on objects, which results in a deadlock. The system cannot recover from this state since no thread can release a lock. 511: A problem has occurred during debugging. 515: The reachable objects form a group that cannot be represented properly by the VM because there are too many objects or the total size of the objects is too large. 516: When committing a persistent object, the VM found that the persistent store id counter has reached its limit. The object was not committed. 517: An inconsistency has been detected in the VM persistent object store. 521: Indicates that Object.wait() has been executed by a thread that holds a lock on another object; occurs only in simulator if the JvmDebugWaits application switch. 522: A thread has acquired two locks on objects in an order that doesn’t match the order that previous locks for the two types were acquired, which indicates a future potential deadlock situation; reported only in the simulator when the JvmDebugLocks application switch is set. 523: A critical Java process has died and the device cannot continue to operate normally. 524: An object has been marked as recovered by the Low Memory Manager but it was not freed during a garbage collection. This is only checked in the simulator under the control of the JvmDebugLMM application switch. 525: Bad persistent object. An auto-commit operation during a garbage collection has detected a non-persistent object reachable from the persistent store root. The type of the object has been output into the event log. 526: The class definition for java.lang.Object cannot be found. 527: The class definition for java.lang.String cannot be found. 528: The file system is corrupted. Data on the handheld is unrecoverable. 529: The file system is corrupted. An attempt is going to be made to recover data, but some data might be lost. 531: Flash memory has been exhausted. 532: A JVM assertion has been violated. This error can occur only in the simulator, not on an actual handheld. 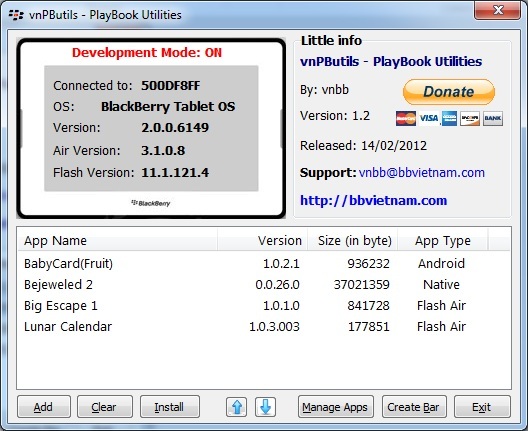 vnPButils – PlayBook Utilities, you can manage applications on your PlayBook with friendly user interface. This entry was posted in 1. My Utilities and tagged Bar, install, Load, PB, PlayBook, Side, Sideload, vnbb, vnPButils. – Lọc SMS không mong muốn. – Tin nhắn SMS từ địa chỉ liên lạc trong danh sách đen sẽ không xuất hiện trong trình xem tin nhắn SMS bình thường. – Tự động xóa khi khi thư mục SMS đen đầy. 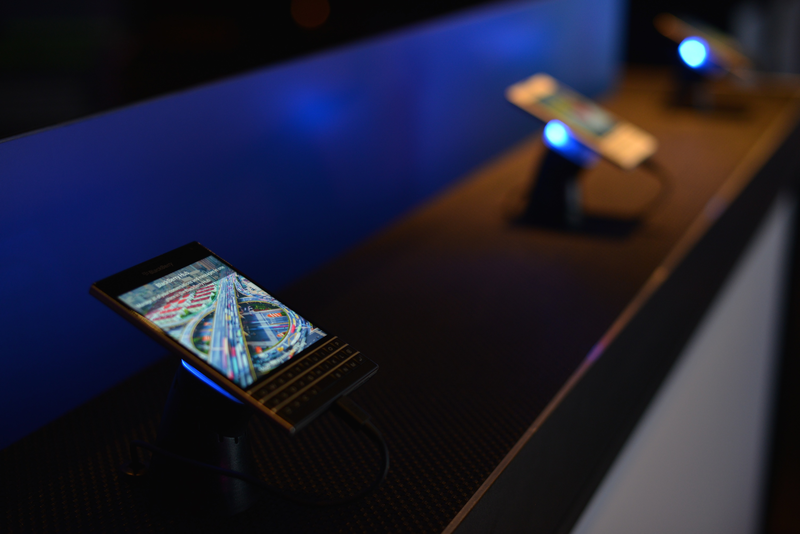 Storm and Storm2 SupportedThe WORLD’S FIRST BlackBerry SMS Filter Application. There are many call, email filtering applications out there. This is the ONLY application that filters out SMS from a BLACKLIST. If you are paying monthly subscription to the Telecommunications Provider, this is THE APPLICATION for you. GET IT NOW. If you are receiving SPAM SMS, this application can filter out the SPAM SMS. SMS from blacklisted contacts will not appear in normal SMS viewer. Filtered SMS are accessible from the application. Filtered SMS will auto purge when folder is full. The application will check for permission, save the permission. Go to options, the status, note down your BlackBerry PIN. Enter your email and BlackBerry PIN, and click Buy Now. A registration k@y will be sent to your via email. On your blackberry, click on the SMS Filter Application icon, press the menu button, select Register and enter the registration k@y receive from email to activate full version. Please read HELP on how to use the application. This entry was posted in Utilities. xContact bring you the features you need most with Contacts manage. xContact is very easy to use, it’s always on the menu when you need it. All you need is click, click and done. When you get a friend’s new number, you need to save it to your Contacts. You can use xContact right on menu, select his/her name and done. You can choose to save the number to a existing Contact or create a new Contact. If you get a SMS from a new number, you need to save it to your Contacts. Easily as before, you can use xContact right in the menu. When asked about a Contact’s number or email, you can reply and find xContact on the menu. Select a name and insert the infomation you need. This feature also works on other apps. your Calendar, Task, Memo and almost anywhere you writing something. Get xContact now and make your Contacts easy to manage. If you need more feature, just contact us.